Red and white quinoa are nutritionally identical. 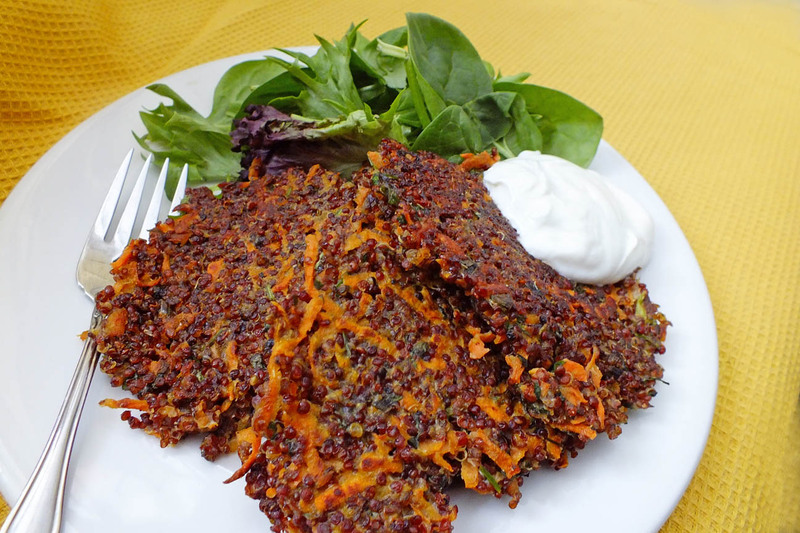 The above photo shows pancakes made with red quinoa. If you want a color contrast, try red quinoa. Anyone who likes potato pancakes will love these. They can be a main dish entrée or used as a side. If you need more protein, beans could supply this in an additional soup or salad. To make this a gluten-free dish, use a non-gluten flour of your choice such as rice flour. Try other shredded or finely chopped vegetables in place of the sweet potato. Zucchini or broccoli would be good. Quinoa is not only a gluten-free whole grain, it’s a complete high-quality protein. It’s fast cooking and a great substitute for couscous and white rice. It’s easily digested and assimilated and its neutral taste makes it good for children as a hot or cold breakfast cereal.